Creamy Tuna Noodle Casserole is an easy casserole to make that is so comforting and brings the familiar taste of home. One of the first casseroles I ever learned how to cook was Tuna Noodle Casserole. This was the perfect recipe for Lent when we didn’t eat meat on Fridays. This casserole can be quickly put together in under 30 minutes. This casserole can be made with whatever noodles or pasta you have on hand. You will then make a creamy sauce for the casserole made of a simple white sauce and a can of cream of mushroom soup. To this, you can add a variety of fresh vegetables to give this casserole some extra flavor. This is a simple recipe that even a beginning cook can prepare. What I really love about this casserole is that it reheats very well. So this is the perfect dish to bring to work or to reheat later in the week. You can’t ask for anything better than it tastes great the first day, and then the next day. If you like you can use a variety of toppings for your casserole. 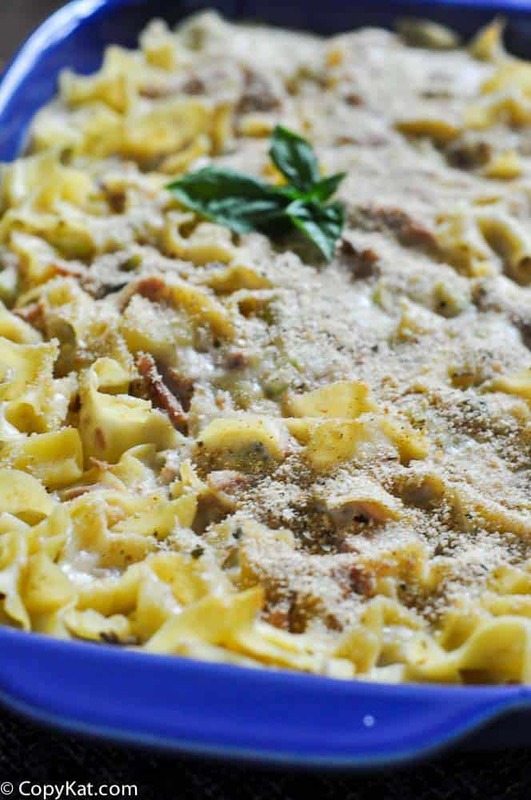 You can use bread crumbs, cracker crumbs, Panko breadcrumbs, or if you like can even crush up potato chips and put those on top for a fun crust to this creamy tuna noodle casserole. For this recipe, I use celery and leftoverhelp add flavor to the casserole. If you have some left over frozen or even canned peas and carrots those would also be great additions to this casserole. Creamy tuna noodle casserole is the perfect weeknight meal. This casserole reheats well. Preheat oven to 350 degrees. Prepare a white sauce in a medium size pot by adding 1 tablespoon of butter and 1 tablespoon of flour over medium heat. Whisk together the butter and flour together for about 1 minute or until the roux becomes fragrant like pie crust. Add about 1/3 cup of milk and whisk this together, the mixture will become thick. When the sauce becomes thick add an additional cup 1/3 of milk, stir together until this becomes thick. Add the remaining milk stir until sauce is smooth. Add chopped onion, celery, drained tuna, and cream of mushroom soup. Add shredded cheese to the sauce. Stir until the sauce is smooth. Reduce heat to low. In a medium-sized bowl combine noodles, and sauce. Pour into a 2-quart casserole dish. Combine melted butter and bread crumbs together. Sprinkle the bread crumbs over the casserole. Heat casserole for 20 minutes in the oven before serving. Your recipe is similar to my mom’s but she added 1 cup fresh green peas and a 1/2 cup cashews. I love her additions. I need to try making this with the cashews! I have never had it like that before.